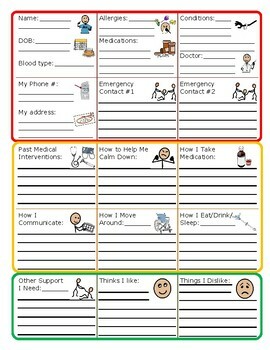 This medical communication board includes a 1-page personal passport to be filled out with medical information, including emergency contacts, medications, feeding needs, and how to make the user more comfortable. It can be used for emergencies or to report symptoms during routine medical visits. This version of the board uses the Symbolstix symbol set found in many AAC apps.